Celebrating the multifaceted World of Ralph Lauren, the 50th Anniversary Collection articulated Mr. Lauren’s singular vision of American design and exemplified the themes and inspiration celebrated throughout his career. The cinematic runway show showcased his latest women’s Collection alongside Polo Ralph Lauren and Double RL for the first time. 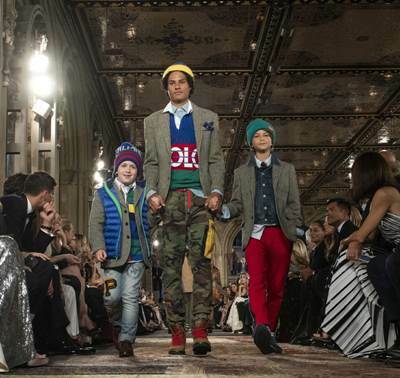 The presentation featured more than 150 models from multiple generations, with iconic faces from the brand’s formative years mixing with of-the-moment models and children. 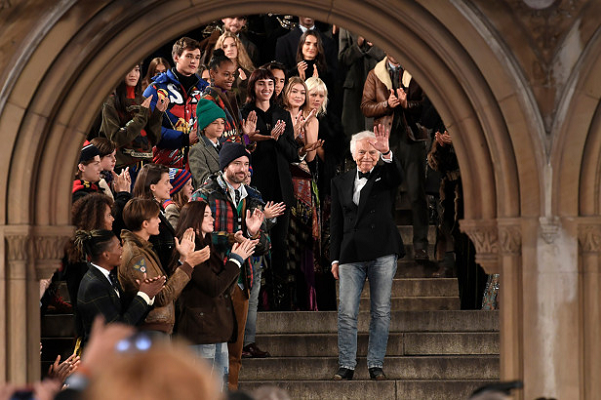 “For my 50th anniversary, I wanted to create and share a runway experience that was deeply personal and a summation of the style I’ve always believed in: personal, authentic, and forever, in a place so quintessentially New York and so special to me—Central Park,” said Mr. Lauren. Adjacent to the runway, a one-of-a-kind immersive digital installation honored milestone of the brand’s history and reflected Mr. Lauren’s pioneering creativity and enduring influence. Guests mingled alongside a series of monolithic LED sculptures, displaying video cuts from 50 years of unforgettable runway shows, which surrounded a large-scale mirrored structure in the middle of the courtyard. Stepping into 50 Years of Reflection—within the mirrored box—guests were transported into the cinematic World of Ralph Lauren as more than 400 images and video from the brand’s prolific archives moved across the walls. Following the runway show, a seated dinner set around Bethesda Fountain transported guests to an elegant Parisian outdoor café, in a setting inspired by the sophisticated yet casual elegance of the courtyard at Ralph’s, Mr. Lauren’s celebrated restaurant on Boulevard Saint-Germain in Paris. The table settings were an eclectic mix of pattern, texture, and material, incorporating bespoke blue-and-white floral-patterned china, pewter flatware and chargers, and simple crystal drinkware, mixed with striped textiles and handmade bread baskets. Select pieces from the Ralph Lauren Home collection were also featured. A classic American menu inspired by The Polo Bar, Mr. Lauren’s restaurant in New York, featured filet mignon from his Double RL Ranch in Ridgway, Colorado. Items from the 50th Anniversary Collection are immediately available at RalphLauren.com and in global flagship stores, including New York, Beverly Hills, Dallas, Chicago, Tokyo, Hong Kong, London, Paris, and Moscow, and through top retail partners including Saks, Bergdorf Goodman, and Neiman Marcus. 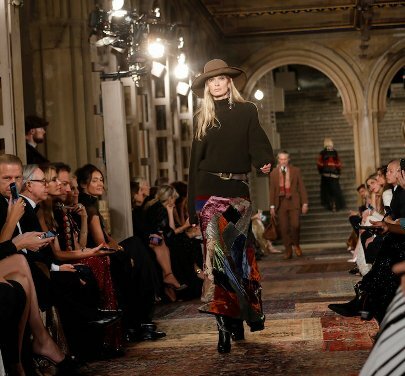 The experience is also made available to consumers worldwide through a live stream on Ralph Lauren’s global social media platforms and at RalphLauren.com.